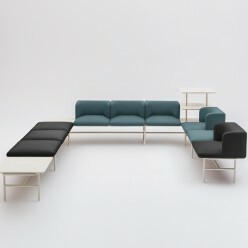 Modular frames which accomodate a seat, seat with backrest, table top or shelf. The Patrition reception range is modular with a choice of frames which accomodate a seat, seat with backrest, table top or shelf. 2 Tables and 1 shelf finished in white or black.